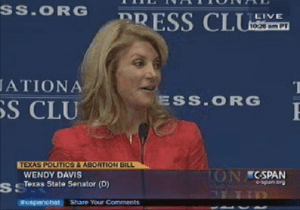 “I can say with absolute certainty that I will run for one of two offices: my state senate seat or for the governor,” Davis said after addressing a lunch held at the National Press Club, when asked whether she’d consider running for other statewide positions. With an answer like this, it seems that Davis is not one to shy away from a fight. And the run at Texas Governor would definitely be just that… given that she is currently at a 20 to 1 funding disadvantage to state Attorney General Greg Abbott. But that probably plays in to the state senator’s choices to speak at the National Press Club luncheon in the first place. 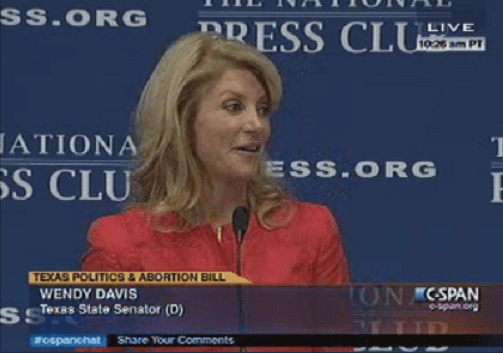 This is what is so exciting about Wendy Davis. As I’ve written previously, she comes from a Senate district that is in many ways reflective of the whole state… both urban and suburban, a roughly even number of white voters and minorities, and a diverse income bracket. She’s spent 4 years working in this circumstance, and dealing with this diaspora of voters. As a result, Davis is much better prepared to run statewide than someone from a “deep blue” district. Her announcement today may not seem like huge news, but it was important for the State Senator to narrow the field, and send signals to fellow Democrats that may have been considering a run for the big spot as well. It sounds like she’ll be making her decision soon, assuming we ever get done with these Special Sessions.